Want to add colors to your plate? Use Blue Potatoes…. If you have read my blog, you will know that I love to browse the grocery store aisles. I love to see what is new, and what is in season. As i was browsing, I saw those cute Blue potatoes amid the red, and the white ones and I thought: “How fun!!!”. They can really add color to your plate. Did you know that there are many varieties of potatoes that can be found these days in markets or online store. Blue potatoes have been popular in South America, but seem to have appear on the American Market only recently. Blue Potatoes are similar to the average potato except in color which makes them excellent if you’re trying to make colorful chips, fancy mashed potatoes or multi-color French fries. 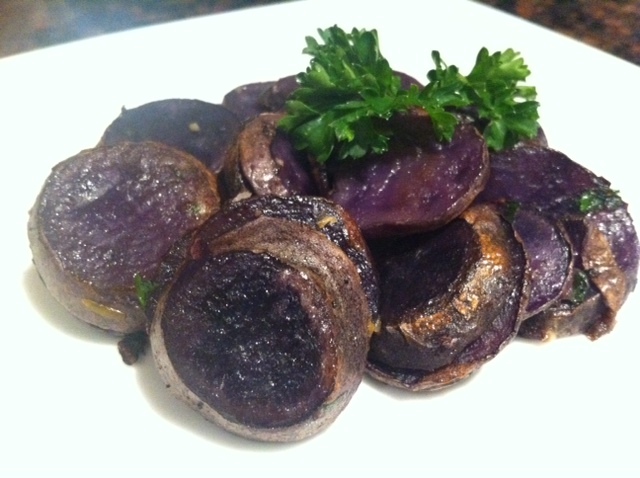 But Blue potatoes are also much healthier than its white counterparts. Most blue fleshed cultivars contain 90 times more antioxidants than white tubers … and the antioxidants in potato tubers are enhanced by cooking them (unlike green veggies that have more antioxidants when eaten raw). So why not add them to your plate?!?! Today my recipe is quite simple, and is quite fast. It is sauteed potatoes with fresh garlic and fresh parsley. Ingredients for 4: 1 small bag of potatoes, 1 garlic clove, 1 Tbsp of chopped fresh parsley, 1 tbsp of olive oil, salt and pepper to taste. Slice the potatoes thinly, and place them in the large round flexiform. Microwave for 5 minutes. Pour the olive oil in a frying pan, and turn to hot. When the oil starts sizzling, add the potatoes. Sautee the potatoes, stirring them frequently so that they won’t burn. When the potatoes are golden and getting crispy, add the garlic, chopped parsley, salt and pepper and mix well. Et voila! How easy was that?!? !